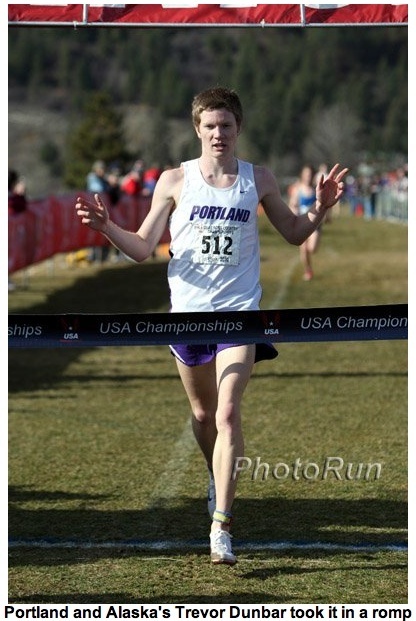 Word out of Spokane is that Trevor Dunbar has WON the US Junior Cross Country Championships and punched a ticket to the World Cross Country Championships in Poland! For those who are slow (in the head), this...is...HUGE! Today is a great day to be a Pilot! Trevor Dunbar (Kodiak, Alaska)--(On taking it out early) If I was feeling good it was and things just felt real easy, probably because I was tucked in and just feeling good and wanted to run my own race. Probably took off a little too hard just because it was windy, but i was able to hold it together. I'm used to running long distances so I've got good consistent mileage under me so I was able to hold on and not die. (On having a big lead when guys behind started to creep up) There were a bunch of spectators around the course telling me the distance behind me and that was real helpful. I was never too worried because I knew I had the lead a little bit, still feeling like a had a gear left. (Course conditions) It was a beautiful day, with the sunshine. Footing was good. When I think of Spokane at this time of year I was thinking real cold so I was happy to get to the race and know that the weather was good. YES!! This is great for the XC program. We've had people run this race many times before (it was/is often held in Vancouver). But I don't recall anyone making the team (or winning outright!) Good luck against the rest of the world Trevor! Huge win for Trevor and for UP. I can't wait to see what the team does in the Spring and next year. I was able to hold on and not die. That's the way I run, too. It looks like it was a pretty comfortable win! This was on letsrun.com's main page by the way. Great advertising for us! And, he was recovering from Strep!